The imposing pink-brick buildings of Toulouse have earned it the nickname ‘la ville rose’. But the city’s emblem is the delicate violet, la violette ‘Parme de Toulouse’. Throughout February, at the peak of the flowering period, the city celebrates the violet. 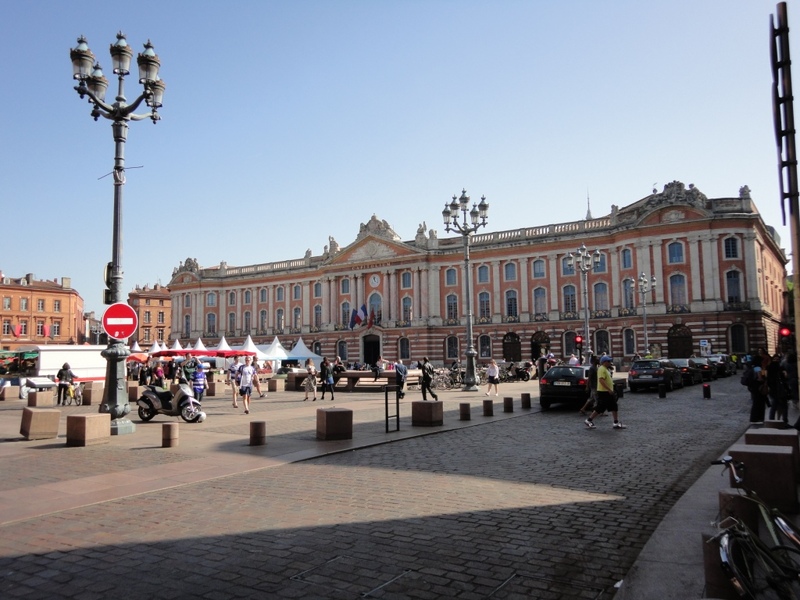 The celebrations include a violet fair and market in the stately Place du Capitole, always held during the first weekend of February. Visiting la fête de la violette in Toulouse was one of my 10 things to do in 2012. I was hoping to be able to tell you about it after visiting it myself. Alas, the Fates, in the form of the cold snap, were against me. Knowing that it was likely to be cold we accepted a lunch invitation yesterday instead of going all the way to Toulouse. However, by nine o’clock it was snowing hard and going anywhere was out of the question. I will have to content myself with recounting what I have read up about the violet fair and defer my visit to next year, weather permitting. Why did Toulouse choose the violet? I read on one site that the violet has been associated with the city since the 14th century. At that time, an annual prize of a golden violet was awarded to the best poet in the city. Some also believe that soldiers brought violets back from the Napoleonic Wars. Growers and perfumers then cashed in on the 19th-century craze for violets. La violette de Toulouse, which is a registered trademark, is a particular strain of Parma violet that is especially sweet-smelling. People prized Toulouse violets highly and the city exported more than 600,000 bouquets every year during the 19th century, even as far as Canada. However, they are very sensitive to disease and extremes of temperature. They almost died out but were saved from extinction during the 1980s. Cultivating this strain of violet is labour-intensive, too, since they require propagation by hand. Nowadays, violets are an important ingredient in the cosmetic and food industries and are sold as bouquets or simply as plants. 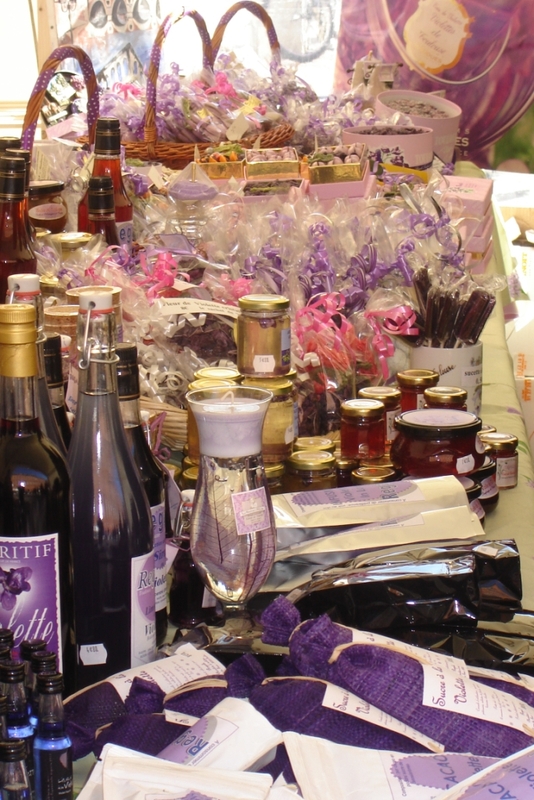 During the fair, you can sample and buy sweets, liqueurs, soaps, candles, syrups and food products – even mustard – all perfumed or flavoured with violets. I believed you can also buy pain aux violettes. In warmer Februaries, the flowers apparently release their delicate perfume as the air warms up. During February, you can also take tours of greenhouses and the National Violet Conservatory. The latter was founded in the city’s municipal greenhouses in 1994 and houses a collection of 80 different strains of violet from around the world. A barge moored on the Canal du Midi has been turned into a shop, la Maison de la Violette, specialising in violet products. A variety of other shops in the city centre also sell violet products. This morning it was minus 13C and the snow had set like rock. Read more about Toulouse violets on the Tourist Office website. This entry was posted in Gardening, History, Places and tagged Fête de la Violette, Toulouse, Toulouse Violet Festival, Violets, Violette ‘Parme de Toulouse’. Bookmark the permalink. Its a good thing my english car has had a flat battery, any thought of driving it in the snow is a real no no – rear wheel drive too. I took it to the Toyota garage a few weeks ago to change a fuse (it is a Toyota) and they all stared out of the window at it as if i’d come in a moon machine. Thankfully they did actually find a fusible for it. I have to pick up my son from a sleep over sunday morning and the forcast is for snow. Perhaps they will have to keep him a bit longer than anticipated and I can put my feet up instead as all roads out of Rouen are on a hill. I would stay put if I were you. We’re forecast some snow down here on Monday night/Tuesday morning and since the ground is so hard it will settle immediately. Are you sure you want to live in France?!! France is more than weather. Of course you want to live in France! Only joking – I wouldn’t live anywhere else now. Of course – France is really great and the impact on our kids attitudes and behaviour is something they’d never have got if we’d stayed in the UK, plus the incredible ability to speak two languages fluently can’t be undervalued. The only reason my car is still my english one is that nothing compares to it in terms of carting usually more than 4 kids around, and since my husband has a french hire car supplied everytime he’s back in france – we have tested every other model and sadly nothing compares. Sadly it very old and rubbish in snowy conditions! I was only joking, really. 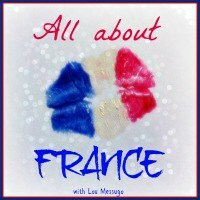 However, it doesn’t hurt to know the downsides as well as the upsides of living in France. Fortunately, the latter outweigh the former. But a lot of people move over here with a rosy-tinted view of how French life is going to be. It doesn’t sound as if you’re in that category. Pain aux violettes…conjures up all kinds of images of the past. And Madame Bovary, for some reason. Oh dear, you poor things and your Siberian temperatures. What a wise decision I made to retire to the Finistère… I think I’ll pull on a t-shirt and go and walk the dog on the beach. Toulouse is best in spring or autumn. In winter it’s too cold and in summer it’s too hot. If only they’d chosen a later-flowering emblem as you suggest. It’s only because it’s so rare to get these temperatures that we’re making such a fuss about it. This is only the second time in 15 years. Don’t forget your shorts and sandals for the beach…and why not have a dip while you’re at it? A wise decision to stay put. I love the smell of violets. We have lots of wild ones on the farm and they have a very delicate fragrance. Beautiful. We also have a lot of wild ones. They’re not the same as the Toulouse variety which needs human intervention to propagate. Very fussy things they are, but lovely. How lovely! I didn’t know about the ‘violets of Toulouse’. We have loads of them in the banks and up at what we call the Special Place – a copse on the hill. They come in all shades from a pale delicate violet to almost purple, and white too. There are wild strawberries in amongst them. Such delicate flowers. Here it’s like an ice-rink too. We’re having to cancel appointments and shopping. Living on a hill is great until it snows, then we’re too far from the main road to risk taking the old girl (our ancient Merc) out – rear wheel drive is hopeless. Oh, well, it is winter. We have a lot of violets in the spring, too. Mostly they are the dark purple variety that grow in patches. One of the first signs of spring. We also have an 15-year old Mercedes, which we use for carting stuff about, and as you say rear wheel drive on ice is not good. Our newer front wheel drive Audi copes better but when it’s like this you need a 4X4. We can usually get out but getting back up our hill is the problem. And, of course, none of the minor roads are cleared or gritted.